One of the joys and necessities of summer is to read many books. Some from my own stacks of books from around my house but many from my school library. I read during the year but the books that are constantly in the hands of young readers escape me until I get them all back, inventoried, and then brought home in a box for me to read. I've started off the summer with two very popular books and I loved both of these quirky, mystery-filled books. I don't know why I didn't read this one when it first came out. I love Messner's work. I love books with both male and female main characters especially when they work in synchronicity as Jose, Henry, and Anna did. I love that this book takes place almost entirely in the DC airport after a fancy event at the Smithsonian Museum. Getting snowed in was the a great way to keep all the characters in one place until the mystery could be solved. The interesting idea of a Silver Jaguar Society made up of descendents of famous concerned people is the perfect vehicle for a series. Even though I had the mystery figured out right after I met the villain (I'm quick that way and I'm not an elementary student) I thought the plot twists and how the kids worked as a team makes this a great classroom read-aloud. I will now be forced to read the rest of this series probably before school begins in August. 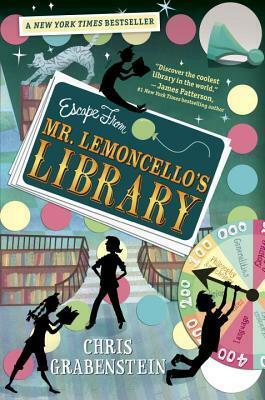 Escape from Mr. Lemoncello's Library by Chris Grabenstein (2013): What a unique story created by Grabenstein! This book would have to get students excited about reading and other books because so many are used to create the game. On the way to school one morning Kyle is reminded by his best friend Akimi about an essay contest to earn entry into the new Alexandriaville library created by gaming genius and bazillionaire Mr. Lemoncello. Kyle, by some miracle wins a spot with 11 other students including Akimi. Once in the library for a sleepover a challenge is made for the students to find a secret way out using clues in the library. Kyle and his friends work together to solve the many-layered puzzles to win. I read this book in exactly 2 days because I loved the kids, the teamwork, and the many book references as well as the amazing look at how libraries and librarians are more than relevant in the 21st century. This one is also the first in a series. My mind worked overtime as I read this book trying to think of a way to recreate a library game based on this book's ideas to start the year off at Hansen. The wheels are still spinning. If you are looking for a good, quick summer read to make you smile or need a book recommendation for a student both of these books will work!